After playing the beta and demo versions of the game a lot, I knew that I had to rule out any possibility of the game actually having some sort of playing style similar to any other Metal Gear Solid game in order to understand the beauty behind it. If you do that properly, you are going to enjoy every second of the game… Just like I did! 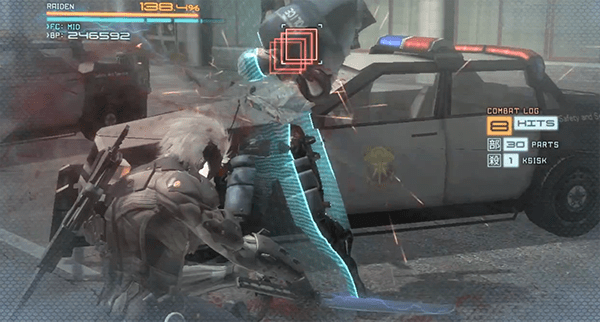 Raiden was first seen with a sword in Metal Gear Solid 2: Sons of Liberty when he was hated by many Metal Gear fans. However, he became an entirely different character in Metal Gear Solid 4: Guns of the Patriots when he’d become some sort of a cyborg ninja. Ever since then, the fans wanted to play as the cyborg Raiden for how badass he was. Here he is now, in a mission in Africa to put an end to what the “Desperados” are planning to achieve after the SOP had started to collapse. Raiden is aided by Boris, Kevin and Courtney from “Maverick” along with Doktor throughout the game as he slices his way through epic battles and dramatic events. As I reached towards the end of the game, it became unexpectedly more enjoyable. The story surely kept me going, getting more and more attached to Raiden and his “friend.” The ending was absolutely marvelous, and by “ending” I don’t mean the final cut-scene only, to me it was the whole final battle as well! The way future AI was interpreted in the game to seem like it can analyze data and feel just like human beings and how that changed the course of the final battle is something worth experiencing. This made Metal Gear Rising: Revengeance an absolute masterpiece, leaving me craving for a sequel. It’s important for everyone to know that Rising is quite different than the other Metal Gear games in many ways. Do not expect to go through the same breathtaking story-telling experience as the past Metal Gear Solid games. Yes, the story is great, but not anywhere close to how Mr. Kojima’s games were like. This is not by any means an issue, but it can be for those expecting a Metal Gear Solid experience. This is a whole new Metal Gear. A different, still impressive Metal Gear. Of course, this is the most important factor in any ‘hack and slash’ game. Rising marvelously excels in terms of gameplay, no doubt on that. The game certainly brings out the evil in you as you progress and learn new skills. The variation of combos and the things that you can do to a single enemy are simply astonishing. You can actually end a combo any way you want with “Blade Mode”. Either you want to cut off the enemy’s arm, leg, fingers, head, cut him in half or just shred him to tiny pieces. Of course, the best thing to do is to cut where it is highlighted with a square to absorb and recover some health and energy and safely continue your battle. Speaking of safety, parrying is a crucial skill to learn. It can decide your fate in battles, specifically boss battles. If you can’t parry, you won’t get past some bosses. As you progress in the game, you will earn money “BP” for your battle quality and whatnot. You can use BP to customize Raiden by enhancing his body, main weapon, skills, and health and energy cells capacity. You can also purchase new weapons that you unlock after defeated bosses. These weapons dramatically change the way you treat your enemies. Obviously, BP is highly dependent on your battle rank in the numerous battles you go through. It is fair to say that getting an ‘S’ rank is quite an accomplishment in most battles as it requires some serious skills to deal with all enemies surrounding you without getting hit! It is always better to plan your battle before entering it. However, some enemies just pop up outta nowhere and you find yourself in the middle of a battlefield. As I mentioned earlier, some bosses are difficult to defeat. Thanks to the impressively masterfully constructed battles, you will enjoy every slice and dice in each battle. Although the game is somewhat short, it is seriously not an issue as every second of the game is as enjoyable as it can get. Nothing is perfect, that’s for sure. Rising has this sometimes disturbing camera that could’ve been a disaster if not for the target lock-on system. Another problem I faced was the irresponsive items menu. Why is it that I have to stand still for a second so that I can bring up the items menu? It can get frustrating at times. Throughout the game, I kept on wondering why wasn’t there more stealth added to it. I mean, I saw the potential of a little bit of stealth where I can hide around corners instead of just standing there waiting for the enemy to walk away, or crawl behind an enemy to perform a stealth kill. Even those “stealth” kills are noisy as hell! They are more “SURPRISE!! !” kills than they are stealthy. However, as a hack and slash game, it is as enjoyable as it can get. Nothing says “you’re doing it right” better than seeing a head chopped off and flying in slow-motion. As much as it can get gory, the game is really pleasing to the eye. The graphical quality is just right for the game. Even though there were some parts of cut-scenes where the graphics didn’t seem to be as good as the rest of the game, but it doesn’t interfere with the enjoyment of Rising. Overall, the visuals in Rising are just as good as they should be. 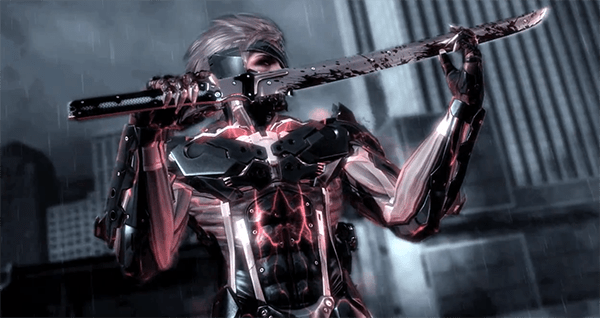 The sound of Raiden’s sword cutting through his enemies is undoubtedly pleasing. I must say, sounds play a great deal in creating that “badass” atmosphere of Rising. My problem here is that there was some very tiny voice acting that sounded a bit off, but it was so minimal that I forgot about it a couple of seconds later. The interesting part here is the music. At some point while in a boss battle, I was like “What kinda music is this! ?” Then I realized that “Well, it’s not a Metal Gear Solid game anyways,” and as soon as I realized that, I was like “HEY, that sounds good!” The music simply sets the right mood for you to unleash your badass combos on your enemy. I loved it! For Platinum Games to introduce the franchise to a totally different genre and still manage to impress, it is quite a great achievement. A well-deserved round of applause for Platinum Games and Kojima Productions!